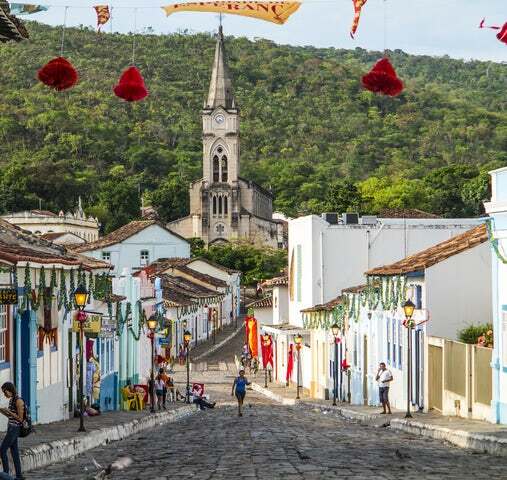 The historic city of Goias is testimony to the colonization of the Brazil in the 18th and 19th century. Its urban fabric is a telltale of how the Portuguese colonists were able to integrate with the locals and make a nation out of many tribesmen. The architectural layout of the town is a classic example of how Europeans were able to adapt to the climatic cultural and geographical conditions of South America. Thanks to use of local materials, the cultural heritage of the local Brazilians was preserved as much as the European construction styles. The public and private facilities are both parts of a whole system that is characteristic of most ancient Portuguese towns. The town of Goias originated from interior explorations by bandeiras from Sao Paulo. The first such expedition to clearly put Goias on the map was the one led by Bartolomeu Bueno da Silva in 1682 and which also found gold deposits in Goias. Due to constant wars with the coastal regions, the interior (read Goias) was a safer bet in terms of mineral exploitation and that is how the town came to be. To avoid the conflicts and insurrections that were common on the coast, the government in Sao Paulo decided to reinforce the local governments and in 1739, Sao Paulo governor chose Vila Boa de Goias as the regional seat of government and this led to doubling of the village’s population. Later in 1748, the government established a smaller administrative center in the present day town of Goias under a governor named Dom Marcos de Noronha (1749-55). In 1750, the town saw its first major construction – the Casa de Fundição. Other constructions would include Casa de Câmara e Cadeia, roads and streets improvement as well as fountains of Carioca and Chafariz de Cauda. As most mining towns, the gold deposits will dwindle in 1770 and the town would enter into a long stagnation such that in 1935, its administrative role was removed. Today, the town is renowned for such tourist attractions as the Gothic church of Rosario, the Casa de Fundição, Chapeu do Padre, Governor's Palace and many more. The town’s cultural value cannot be gainsaid, and this is why it was inscribed into the UNESCO World Heritage Sites in 2001.